Growing up I always loved fire. I was mesmerized by my parents' fireplace. I was always the kid sitting closest to the campfire. Once I dumped alcohol on a burning fire and got my first lesson in fuel flow -vs- rate of ignition as that bottle of alcohol took off like a rocket. I became a volunteer firefighter during college where I studied electrical engineering and computer science. I've always loved technical art forms; woodworking, photography, metal work. Anything involving tools, equipment and working with my hands. I took a 15 year hiatus from these loves while I was involved with the computer industry, the last ten of which I spent as a senior systems analyst for a major computer manufacturer. 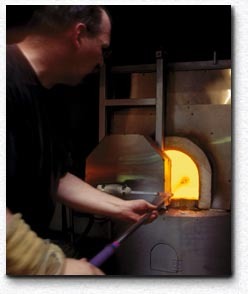 I had seen glass blowing once and subconsciously knew it had all the right ingredients: a lot of tools, equipment and most of all a lot of fire. In 1991 I went to a craft show where I rediscovered these interests and saw the most amazing blown glass work. 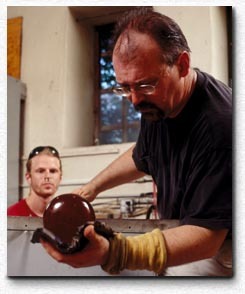 Later that year I was off to the Penland School of Crafts for a month where I learned glass blowing from several internationally known glass artists. I knew right away. Before I left Penland the first time, I had signed up for another 2-month intensive in the spring of 1992. Having no idea how I was going to handle this with my real job, I went back and turned in my notice. By the fall of 1992 I had my own studio. I still love the fire. I love running my studio, building equipment and teaching classes. But most of all I love creating the work; Molten, fluid, hot (really hot!) glass being shaped, coaxed, encouraged into form with only a few simple tools. it's just me... by myself... with the fire.